Volvo - The Unseen Ocean from Grey London on Vimeo. The fight against plastic pollution in our oceans is at the heart of a new film by Volvo Car UK and Grey London, for Sky Atlantic. ‘The Unseen Ocean’ focuses on Tom Franklin, a primary school teacher who also runs City Kids Surfing, a programme that teaches children to swim and surf, and educates them about the environment. With Tom’s mission to help children from the UK’s cities become future guardians of the world’s oceans, the film follows a group of young children as they travel from south London to the Cornish coast and captures the moving moment they get to witness the natural beauty of the sea, before being given the chance to splash in the waves for the first time in their lives. As well as feeling the power of the water against their skin, they are also given lessons in its fragility. They collect plastic waste that’s washed up on the beaches and are taught about the impact this has on the delicate ecosystems in and around the planet’s oceans. 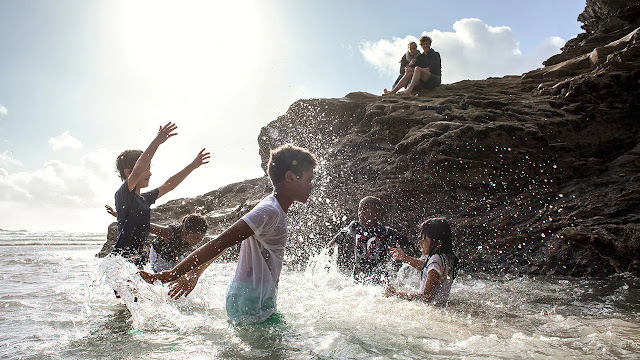 Tom, who was a teacher in South London, developed his ocean education programme after realising the future health of the seas lies in the hands of kids who may not have experienced its awesome beauty first hand. He set up his not-for-profit organisation to take children to British coastlines to help them understand their role in protecting it for generations to come. The campaign supports Volvo Cars’ sustainability programme, which is one of the most ambitious in the automotive sector. Earlier this year, the firm announced that by 2025 it aims for at least 25% of the plastics used in every newly launched Volvo car to be made from recycled material. It has also committed to removing single-use plastics from its offices and events across the globe by the end of 2019. In September, Volvo became the first and only car maker to endorse the G7 Ocean Plastics Charter, which commits governments to take concrete steps towards addressing the issue of ocean plastics pollution. ‘The Unseen Ocean’, which features the Volvo’s XC90 T8 Twin Engine and V90 T8 Twin Engine plug-in hybrid vehicles, will air on Sky Atlantic from 1 October as part of Volvo Car UK’s sponsorship deal with the channel and will be available on Video On Demand for a year. This film, the sixth in the series, was directed by D.A.R.Y.L via Pulse Productions and shot on location South London and Porthcothan Bay, Cornwall. Previous films have been recognised with awards including a D&AD Pencil and Cannes Lions.